We’re just back from the California Rare Fruit Growers’ annual scion exchange in Sacramento, which is The Place To Be if you’re a tree collector! 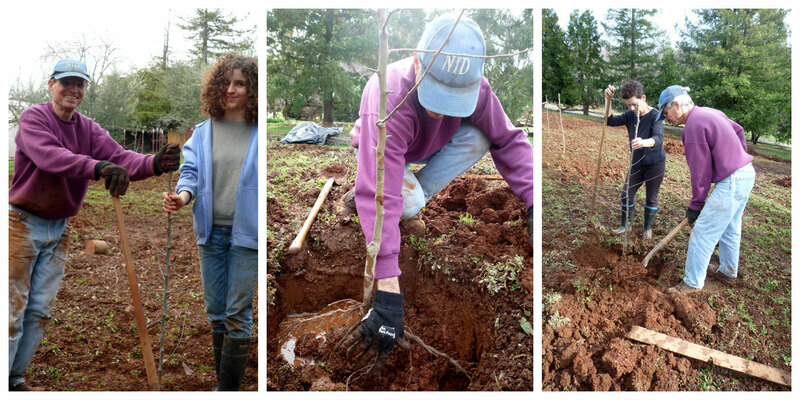 Members bring and give away cuttings from their unusual fruit trees, which can then be grafted onto an existing tree or rooted in soil, depending on the variety. The cuttings are labeled with the variety, and the names are often wonderfully evocative: Blue Celeste, Col de Dame Noir, and Igo figs; Diamond Muscat grape, Shangri-la mulberry, Rossenkya persimmon, Parfianka pomegranate… not to mention the hundreds of varieties of apples, peaches, plums and cherries. 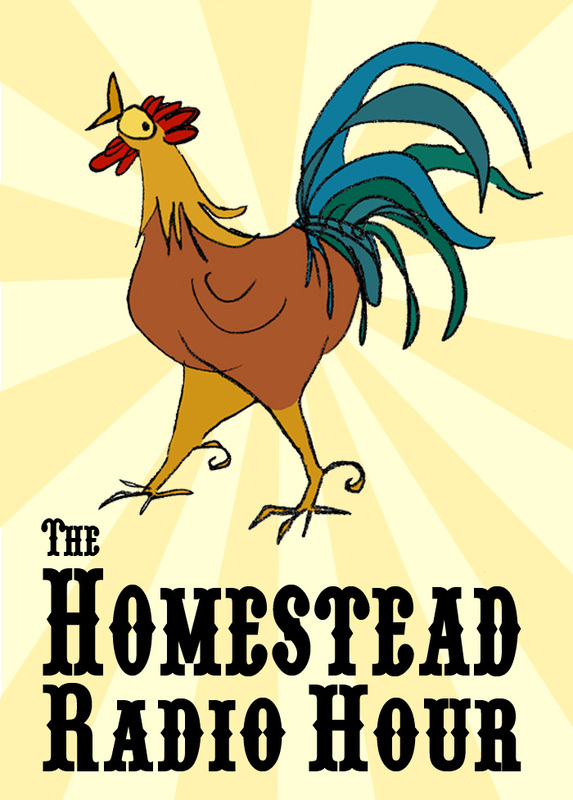 It’s a great way to preserve rare and heirloom varieties, and to add some character to your orchard! If you missed the exchange but would like to start some new trees of your own, not to worry — now is the time of year to start thinking about propagation. 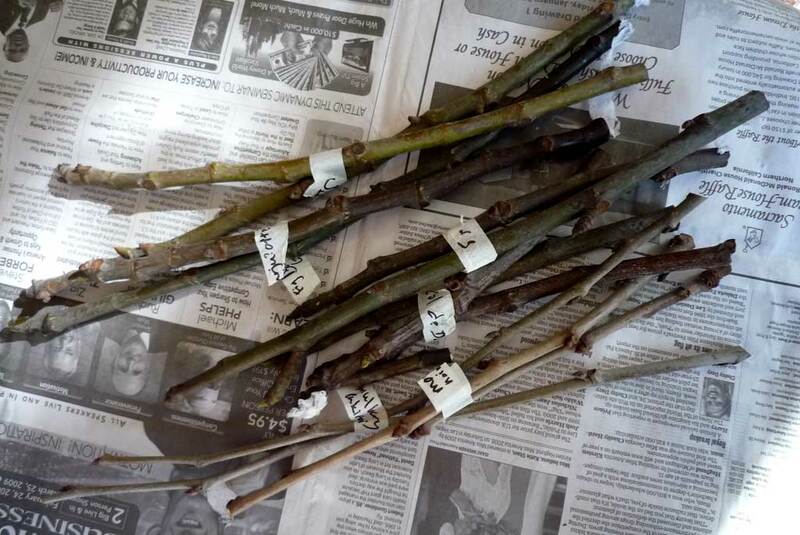 It’s quite easy to root cuttings such as grape and fig, and local nurseries and garden clubs often hold grafting classes in the winter and spring. For information and instructions on rooting cuttings, check out our blog post from last year right here. I could have spent all day in this place! 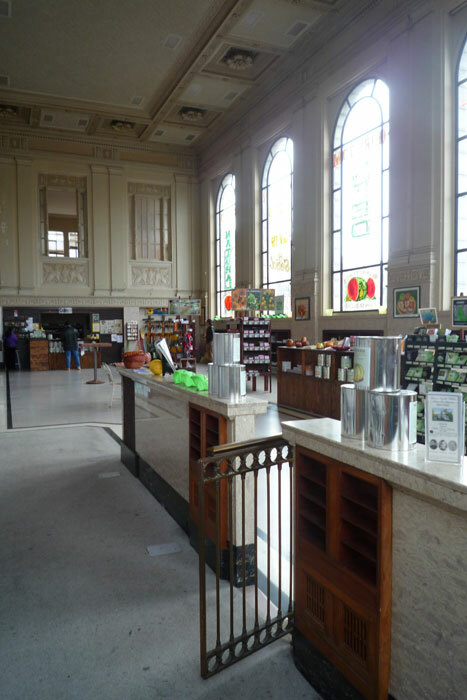 Hundreds, probably thousands, of heirloom seed varieties, housed in the gorgeous historic Sonoma County National Bank building, arrayed on shelves tailor-made for browsing. 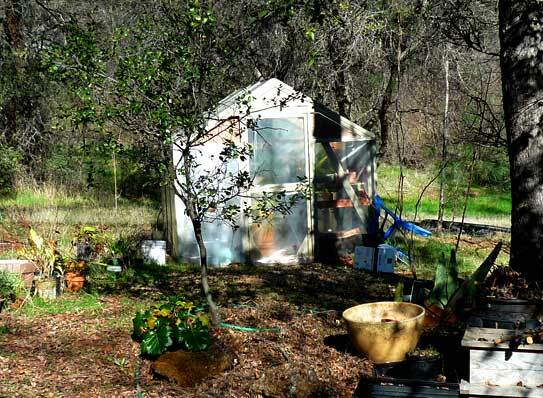 The company, family-run by Jere and Emilee Gettle, is based in Missouri and recently opened its first outpost — the Seed Bank — in Petaluma. Their catalogue is a delight, brimming with information and lovely photographs that will make you long for Spring. And, of course, the seeds themselves: giant “Yellow Monster” peppers, gooseberry gourds, a veritable rainbow of winter squash, antique sweet peas, Flamingo Pink Swiss chard, Japanese morning glories, Speckled Trout lettuce… you get the idea! Their catalogue is free, and available here. 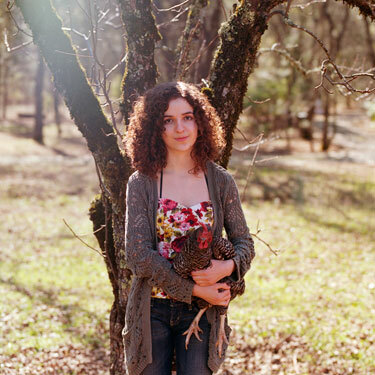 And, if you happen to be anywhere near Petaluma, the seed bank is definitely worth a trip! 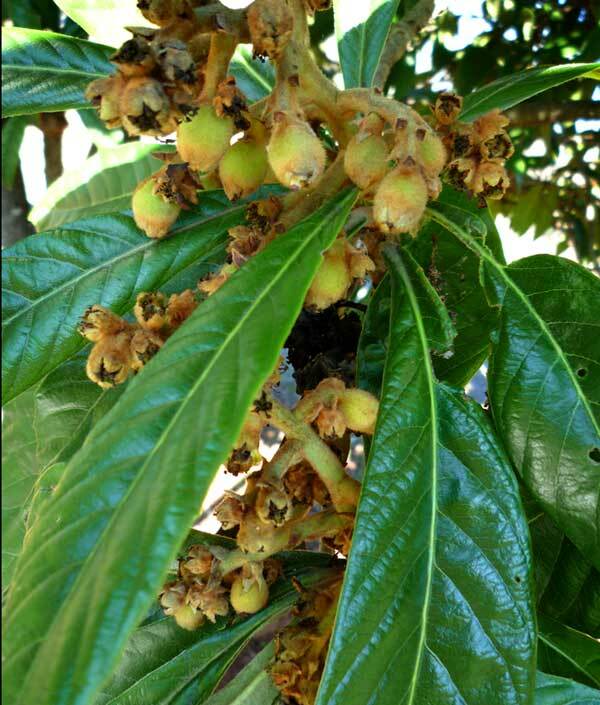 Winter Wonder: Why We Love Loquats! One thing a photo can’t capture is the fragrance… heady, sweet but never cloying, a trace of vanilla… it’s unlike anything else, and I look forward to it all year. It has a marvelous way of drifting, traveling with the breeze and drawing you — and the bees — straight to the source! The small, cream-coloured flowers aren’t overly showy, but the trees themselves have a lush, almost tropical beauty: foot-long, vividly green leaves, shiny on the tops and fuzzy underneath. As a tot, I would make loquat “shoes” every summer by tying the biggest leaves I could find to the soles of my feet with strips of grass. Come to think of it, when the weather warms up I just might make another pair; one can never be too old for Loquat Shoes! 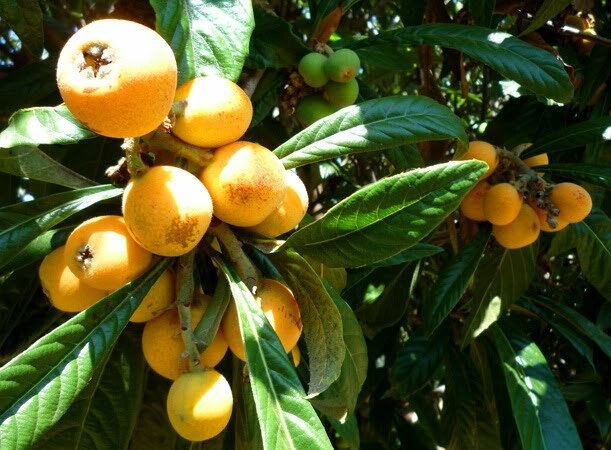 For such a showy tree, loquats are really quite well-behaved — no invasive roots or shoots, little raking or pruning required, tolerant of cold and heat, drought and frost. And, for the little care they do ask for, you’ll be rewarded all year long with luxuriant shade, tasty fruit and that splendid winter perfume! 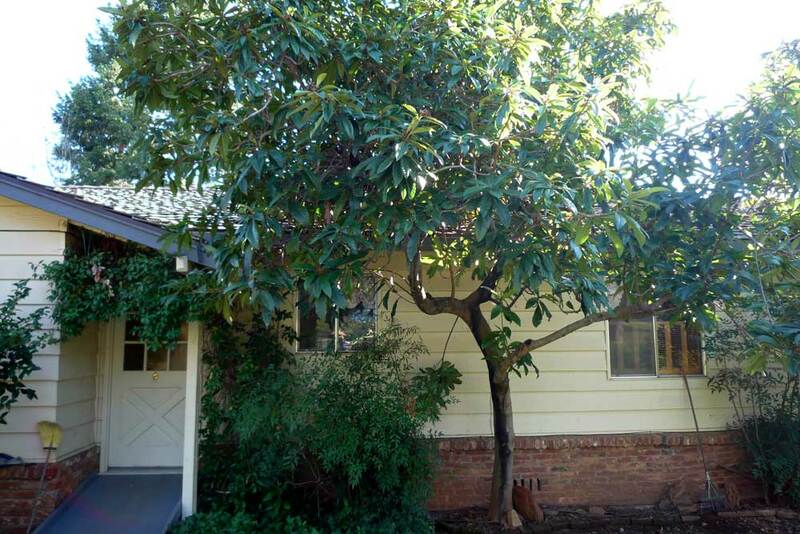 What more could you ask for than a loquat tree in your yard? …but figs, we’ve found, are one of the easiest trees to propagate. Start with clean, straight twigs, about a foot long, taken from a tree’s new growth — the dark, smooth branches, not the rough gray ones. 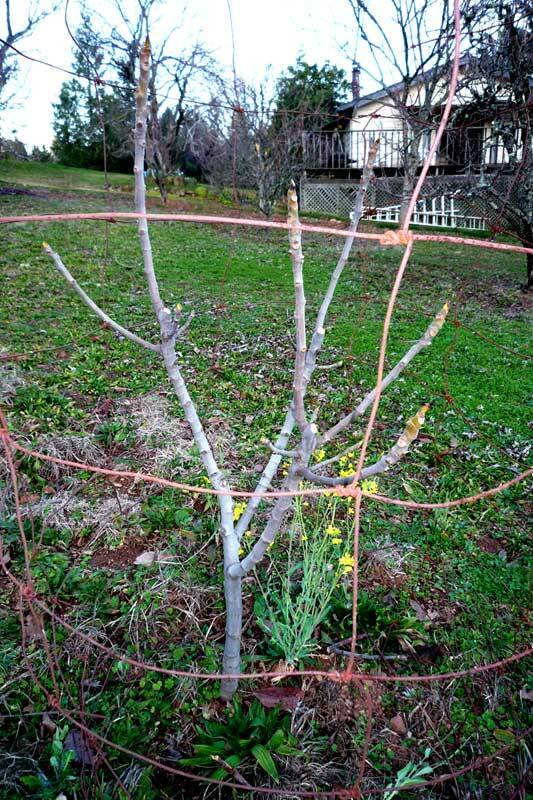 Make sure your cutting has plenty of buds; these will be the points at which the twig takes root. You’ll also need pots and dirt. (We’re using one- and five-gallon plastic pots filled with fresh potting soil. Clean, new dirt reduces chances of disease, and good drainage is important; you could use compost or garden soil, but we’d rather not take chances!) Have a pair of clippers handy, and another stick for digging holes. 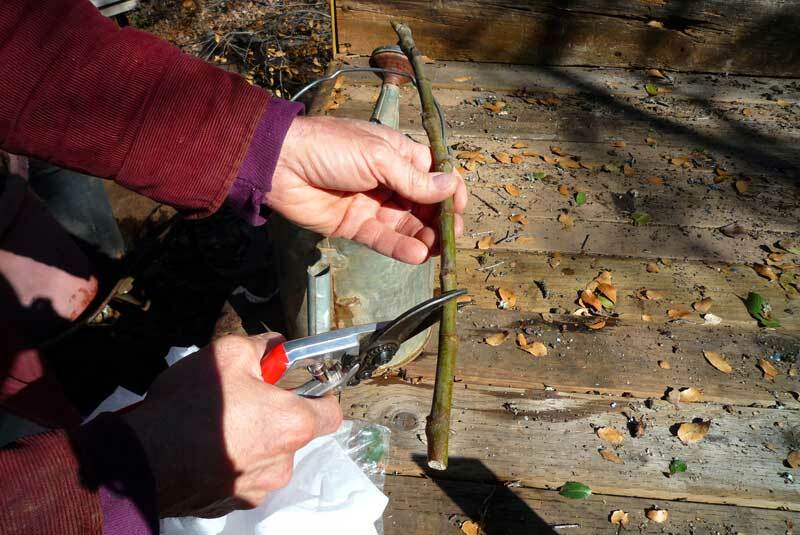 Begin by filling your pots with soil and trimming your twigs to wherever the buds are densest — most of ours are about 8 to 10 inches long. Again, the buds will sprout the roots, so you want as many as possible in contact with the soil. You can watch this sprouting process, if you like, by placing a spare twig in a jar of water and setting it on a window sill for a couple weeks; when the white roots start to emerge and grow, go ahead and plant the twig. 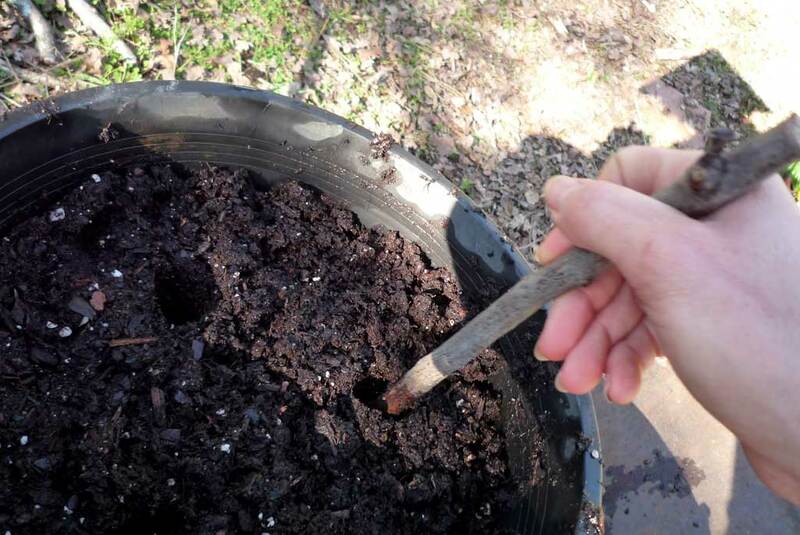 Use a stick to “drill” the holes in your pot of soil. One-gallon pots are good for one twig, while a five-gallon pot will hold two or three and will need watering less frequently. (A good thing — rooting cuttings need regular water in order to “take”.) Place the cutting several inches deep in the hole, enough to cover at least two or three buds, and press the soil down firmly. And if you’re planting more than one variety, don’t forget to label them! Here’s a fig tree we started from a cutting a couple years ago. 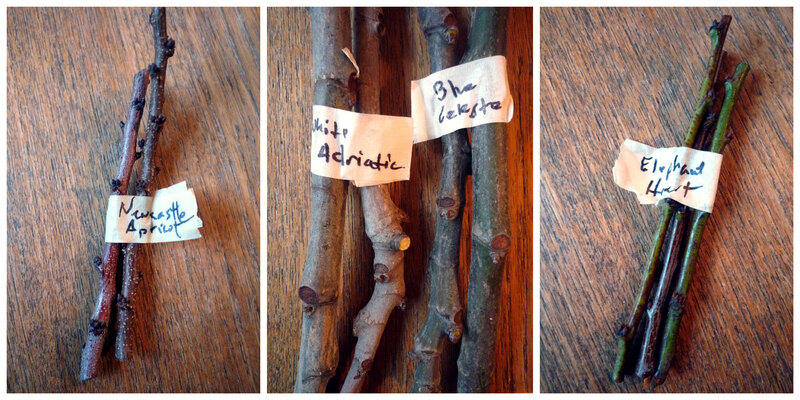 As you can see, it’s a far cry from the little twigs we’re planting today — but with any luck, they’ll do just as well!